Adam Boqvist figures the last time he scored four goals in a single game was when he was about 10 years old. 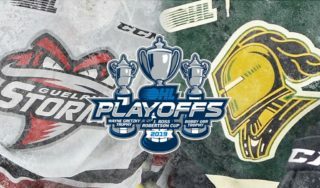 On Tuesday in Windsor, Boqvist managed to repeat the feat in a key playoff game against Ontario Hockey League competition to help the London Knights to a 6-3 victory over the Spitfires. The Falun, Sweden native and Chicago Blackhawks first-rounder scored the first four London goals of the game and accounted for all of the Knights’ scoring with a goaltender in the opposing crease. Liam Foudy and Alex Formenton added empty-netters late to seal the win and a three-nothing series lead, with Game 4 on Thursday at the WFCU Centre. London assistant coach Dylan Hunter marvelled at the fact that three of the four goals by Boqvist came on the power play and yet he scored each one in a different way. Hunter admitted the coaching staff has been asking Boqvist to put his shot there. Four goals may have him trying it again. Windsor head coach Trevor Letowski had said that his team needed to play like the game could be their last, and they did. 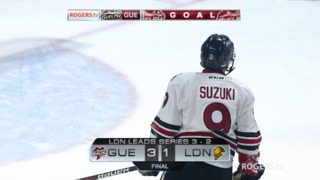 The Spitfires scored two goals in the second period to climb in front 3-2. Windsor had held a 19-0-1-1 record when leading after 40 minutes but could not keep the Knights off the scoreboard and could not beat Jordan Kooy, who made 25 saves for his third win of the playoffs. London went three-for-six on the power play and four-for-four on the penalty kill. The Knights put 13 pucks on the Spitfires’ net in the third period and outshot Windsor 29-28 in the game. Windsor took their first lead in the series with the first goal of the game at 14:36 in the first period. Rookie Will Cuylle knocked in a rebound in front of the net to make it 1-0 for the Spitfires. The Knights tied the game on a power play as Formenton fought through a check and dropped a pass back to Boqvist, who wristed it past Windsor goalie Colton Incze at 19:10 to tie the game. Boqvist scored to make it 2-1 on another London power play 5:21 into the second period. 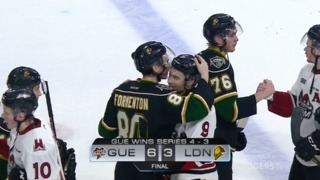 Evan Bouchard assisted on that goal as well, giving him nine points in the OHL playoffs. He and Nate Schnarr of the Guelph Storm are tied for the lead in points through three games. Tyler Angle tied the game 2-2 on a short-handed goal later in the second, and then Louka Henault wristed a shot into the top corner of the Knight net to put the Spitfires ahead 3-2 through 40 minutes. Boqvist completed his hat trick at 8:09 on another London man advantage and then got the game winner with just under seven minutes remaining in the game. Foudy and Formenton added empty-net goals inside the final 90 seconds to complete the scoring. 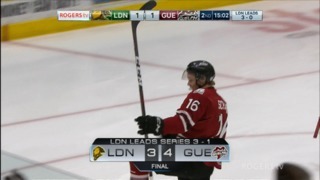 London and Windsor will play Game 4 on Thursday night at the WFCU Centre.